Positive descriptions have been accorded to Asik Asik Falls, North Cotabato’s newest tourist attraction, which has, until recently, remained hidden from the public eye. Asik-Asik Falls, situated in the remote sub-village of Dulao in Barangay Upper Dado, Alamada town, North Cotabato Philippines, is very small compared to the likes of Katibawasan Falls in Camiguin or the second falls of Lake Sebu’s Seven Falls, as it only drops a few meters. But what is unique about Asik-Asik Falls is that it comes out of a cliff at the edge of a flattened hill, which is not even a stream or a canal. As such, water gushes out of cracks in rocks on the cliff and literally sprinkles into a river below. That portion of the cliff looks like a very large green wall highlighted with white diaphanous curtains. “Asik” is the Hiligaynon equivalent of the English word sprinkle. Ilonggo residents in the area gave the falls its name. Iranons in the area call it “Panguranan,” which means rain or drizzle. Water raining down from the falls is so cold and clean that visitors can drink from it. Other locals even claim the water from the falls could heal some illnesses. Its water source has remained a mystery. The area surrounding the falls is a dry agricultural upland, planted mostly with corn and a number of other upland crops. The nearest body of water, Lake Baranibud, is approximately 10 kilometers from the site toward the boundary of North Cotabato and Lanao del Sur. Its discovery was also accidental. Residents that live and come to North Cotabato Philippines have known that water is flowing from that side of the hill but were not quite sure of its form, as the area was covered by thick vegetation. Alamada Mayor Bartolome Lataza reported that a series of events led to the discovery of the hidden treasure, starting with a fire that razed some of the vegetation covering of the area followed by a landslide that carved out part of the hill and uprooted some trees, bamboos, and a large “balete” tree. In December last year, Jun Miranda, a village councillor, visited the area and discovered the falls. 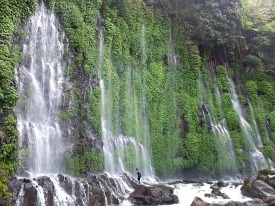 Thanks to Facebook and other social networks, blogging by some enthusiasts, and a report by a national TV network, Asik-Asik Falls has become a sensation. Lataza said visitors that come to the area on weekends could easily exceed 1,000 despite some difficulty going to the place. For one, the site is 20 kilometers from the Poblacion of North Cotabato Philippines, and most common mode of transportation is the “habal-habal” motorcycle that could carry as many as five persons in one trip across a bumpy dirt road that turn mushy during heavy rain. After the motorcycle ride, visitors need to walk more one kilometer of footpath across rolling hills to reach the falls. Mayor Lataza considers the discovery of the natural wonder a heavenly gift and vows to protect the destination’s pristine environment. “Because of this, local government in coordination with the Sangguniang Bayan is now working on establishing policies that would develop as well as protect the site,” the local chief executive said. Recently, several tree planting activities have been conducted in the vicinity by some civil society groups and students as an initial move to develop the area. Meanwhile, North Cotabato Gov. Emmylou Taliño-Mendoza has created a technical working group whose sole responsibility is to assure the implementation of a sustainable eco-tourism project in the area, in coordination with the village residents and the local officials. Ralph Ryan Rafael, executive assistant to the governor and tourism focal person of the province confirmed that Gov. Lala has allotted P1.5 million as initial funds for the development of the eco-tourism site. He said that the provincial government aims to promote the Asik-Asik Falls as Southeast Asia’s most beautiful spring falls.